In posts that begin with "Recipes" you will find recipes for famous and not so famous Italian dishes such as Tortellini, tortelloni, limoncello, Bolognese (or Bolognaise) ragu' as well as many other pasta dishes representing Italy. Every time you see a post on my Instagram account @maribel_italy_pasta that says you'll find the recipe on the website, you'll find it here. Done so for practical reasons: it is much easier to type on the computer than on the telephone. Limoncello as an after dinner drink has become almost as popular and famous as pizza. If you dig a little deeper; however, you’ll see that limoncello has a a strong link to its sunny place of origin: sunny southern Italy! Sorrento, in the province of Naples, or the Amalfi coast, in the province of Salerno, both produce large, lemons that have a sweet aromatic zest. 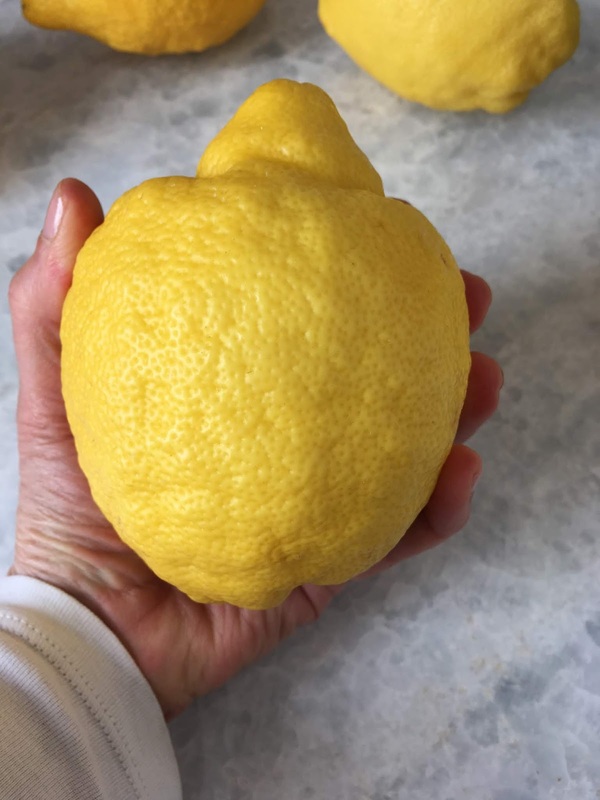 Believe it or not, the Sorrento and Amalfi lemons are two distinct species, both with IGP or Protected Geographical Indication, in English. 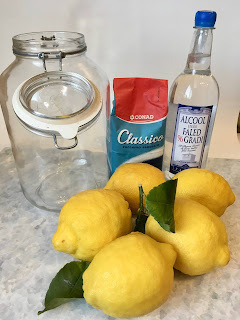 Although many recipes for Limoncello abound on the internet, the recipe below is the one people in the South actually use. you may not be used to this degree of alcohol but I suggest you prepare it with 1 liter water, you can add up to 500ml more water later. Remember that Limoncello is an after meal drink that you sip from a small glass the size of a shot glass. It aids digestion so the heavier the meal the easier it is to drink this strong limoncello. No one I know ever drinks it on an empty stomach because it is quite strong. As always, keep alcoholic drinks away from children and drink responsibly! Equipment: 1 large jar, larger than 2,5 lts. 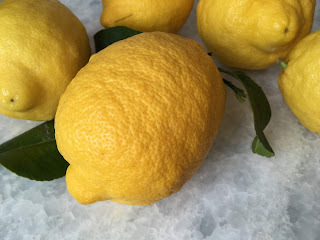 Wash lemons to remove dirt and dry carefully. 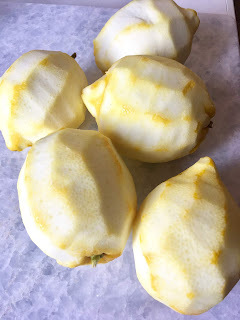 Peel lemons carefully so that you only use the zest (yellow part) and none of the pith (white spongy part) which is bitter. 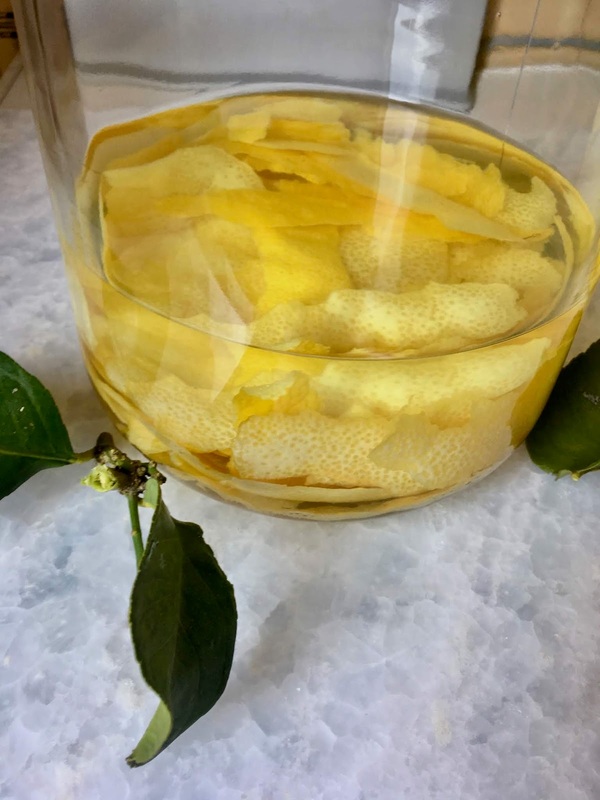 As you peel, drop the peels directly into the alcohol so that you save all of the lemon’s essential oils. Once done with the peels, seal the jar carefully and keep in a cool dark place for 30 days. Prepare syrup made with sugar and water, mix and allow to rest for another 30 days. Filter the drink into smaller bottles. Keep in the freezer, the amount of sugar and alcohol will keep it from freezing. Sip your ice cold limoncello after dinner on a hot evening. If looking for authentic, nonna style Italian cooking, fairly easy and practical with lots of tips, look no further. At Taste of Italy you will learn how to make fresh pasta, ragu' Bolognese, risotto, tortellini, tortelloni, lasagne, cook with Parmigiano-Reggiano cheese and Traditional Balsamic Vinegar, learn about wines, make dessert and antipasti. We are happy to accomodate Vegans, Vegetarians, No lactose, No pork, and a number of other food issues! Check the Cooking Lessons tab (above) and write to us ASAP. The Cauliflower is a wonderful little vegetable that is in its prime season right now. The only thing is that I sometimes run out of ideas on how to prepare it when trying to lose some holiday weight. If I wasn't concerned with losing some holiday weight, I'd prepare cauliflower in a typical fritto misto of Emilia-Romagna (breaded and fried along with other seasonal vegetables) or in grate', baked with a bechamel sauce and covered with crispy breadcrumbs, like my mother-in-law used to make. But since alas, I enjoyed my holidays and have some extra weight to show for it, I shall pass on the fried and baked goodies. Trying to lose weight means eating lots of vegetables with the least amount of condiment as possible. After you have tired of eating it steamed or boiled with a drizzle of olive oil and salt, I suggest you try the recipe below. I imagine that I am not the only one who has some weight to lose and this following dish is healthy and diet-worthy as long as you don't eat the whole bowl! What it lacks in calories it makes up in flavor! It is also a great vegetarian and vegan dish that doesn't call for any special ingredients. This can also be made gluten-free by choosing the GF type pasta. My son who is a meat lover enjoys this dish as if it were a piece of steak. Is there a better endorsement than that? This pasta dish is super tasty and easy, another plus! Tip: Get a cauliflower large enough for the number of people you wish to serve. dried, hard wheat (durum) or gluten-free pasta, a short, hollow shape is best. The amount is up to you. Trim, rinse and cut the cauliflower in 1 cm slices and drop into boiling salted water. In the meantime, get a large enough bowl to hold the cooked pasta and vegetable and add a good 2 tablespoons of extra virgin oilive oil. Now peel and squish the garlic and immediately drop it into the large bowl with olive oil. Rinse and dry the parsley and cut as small as possible pieces using the stems. You can use kitchen scissors for this. Check the cooking time on your short pasta. When the cauliflower about the same time away from being done as the time it takes to cook the pasta, you could add the pasta to the same pot where the cauliflower is cooking or cook the pasta separately. When cauliflower is cooked through drain and add to bowl, mixing well. If cooking separately, when pasta is done, drain and add to bowl. Add more olive oil if necessary. The raw garlic and parsley gives this pasta so much flavor that adding cheese would be overdoing it. How do you enjoy your cauliflower? Panspeziel (left) and Certosino (right), both traditional Bolognese Christmas holiday cakes. While most people may be familiar with Milan’s (Italy) “Panettone” and the “Pandoro”, both golden buttery and yeasty cakes, in Bologna, we have the “Certosino” and “Panspeziel”. And while less known, once you taste these cakes you might well become addicted to them. 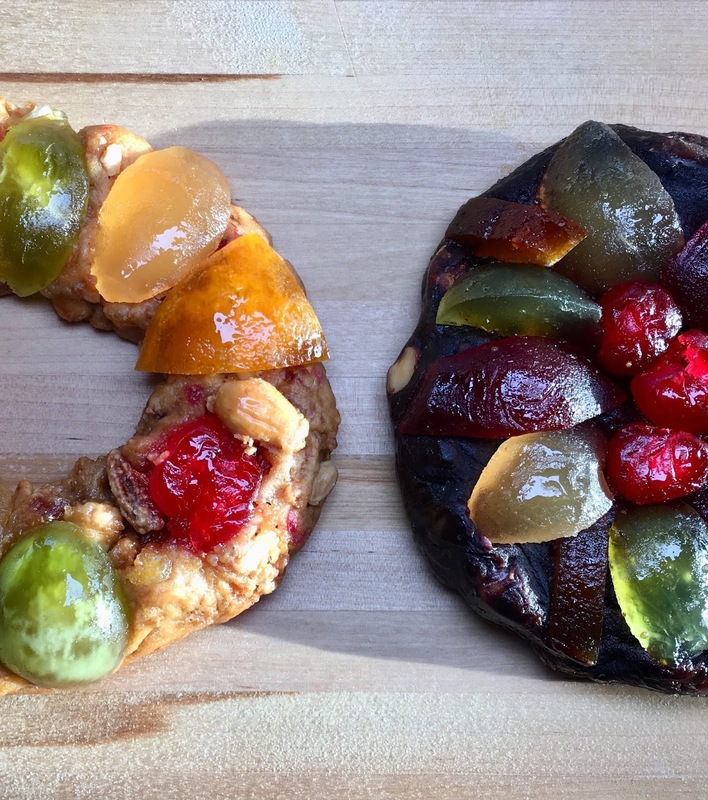 The “Certosino” also known as “zrtuséin” in Bolognese dialect, is Bologna’s traditional Christmas cake which contains honey, almonds, pine nuts, cocoa powder, bits of dark chocolate and candied fruit. Many people call the “Certosino” “Panspeziel” (“panspzièl” in Bolognese dialect) and while very similar, the original “Panspeziel” did not contain any cocoa or chocolate. In medieval times, the “panspeziel” cakes were prepared by trained apothecaries (one could also refer to them as medieval pharmacists) or “speziali” in Italian. Hence where the term bread from the speziali “panspeziel” came from. This Bolognese cake belongs in the “panforte” category as it is dense, rich with nuts and candied fruit, no yeast and needs a period to mature before it should be eaten. Expert “speziali” have existed since Roman times and their knowledge survived the dark period in the middle ages, thanks to the “speziali” in the convents. These clergy carefully guarded the recipes and passed on the “art of making apothecary preparations” along the church’s pilgrimage routes. The Carthusian (Certosa in Italian) monks arrived in Bologna in 1330. The monks of the Certosa order began producing this cake and the “Panspeziel” became known as the “Certosino”. Although today’s “Certosino” includes chocolate and cocoa powder the original recipe did not have either of these ingredients. Cocoa was probably added to the “Certosino” after 1600, when cocoa powder became available in Europe. In wouldn’t be until 1847 when hard chocolate was invented so the dark chocolate bits in the “Certosino” are a relatively recent addition. The “Certosino” is not to be confused with the “Panone”, another traditional Christmas sweet cake from the Bologna area. The “panone” was probably the average person’s cake vs the “Certosino”. The original “Panone” had some ingredients in common with the “Certosino” but in smaller quantities plus the “panone” has yeast which makes it soft and cakey. A fusion definitely ocurred as nowadays many recipes for the “Panone” are indistinguishable from the “Certosino”, with the exception of the yeast. The original panone appeared as a plain dark brown cake and these days it looks like a bejewelled queen! Although many use the terms “Certosino” and “Panspeziel” interchangeably, there is a bakery in Bologna where it is only called “panspeziel”. Curious as I am, I had to have both Billi’s pastry shop “panspeziel” and Atti bakery’s “Certosino”, one without chocolate and one with. All in the name of research! Billi Pasticceria is located at the end of via Saragozza, right before you head up to the San Luca Sanctuary. This historic shop has been open since 1833 and have been making the “Panspeziel” ever since. This bakery’s cake is so special that it is made year round but it is also sold in thin slices, the best way to taste it! Billi’s “panspeziel” is golden in color (it has no cocoa or chocolate, hence the light color) and is soft to the bite, with the glistening candied fruit looking like jewels. The spices are perfectly balanced and with the lovely flavor of the honey and the candied fruit coming through nicely. The Paolo Atti & Figli bakery has been operating continuously and run by the same family in Bologna since 1868. They have 2 shops in the heart of the outdoor quadrilatero market in Bologna’s historic center. Atti’s “Certosino” is rich with candied fruit, dark chocolate and cocoa powder which is why it is dark in color. Their recipe also includes honey, jam, cooked fruit, almonds and pine nuts. This cake is so good, they won the prestigious “Dino Villani” prize from the Academy of Italian Cuisine in 2007. 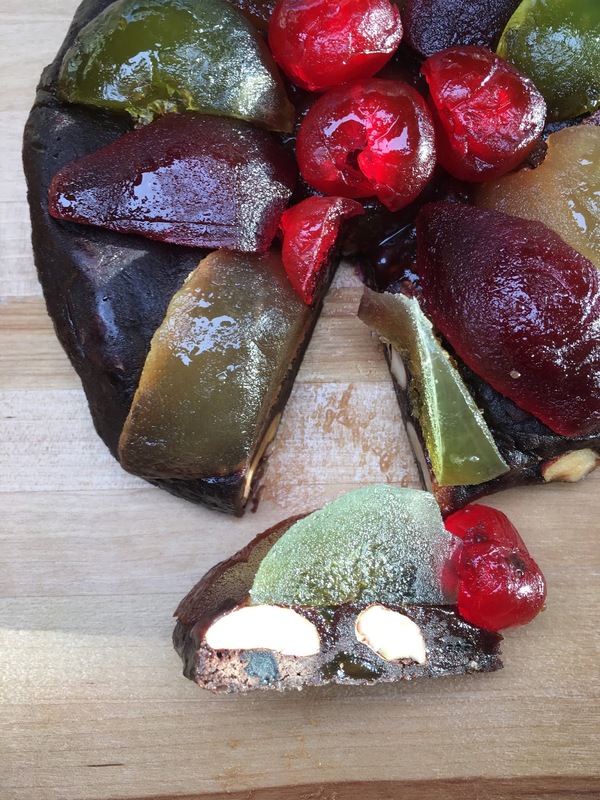 The “Certosino” needs to be aged, some modern day cooks recommend at least two days of aging but it is traditional to make them well beforehand, at least by mid-November in order for your cake to be perfectly matured and delicious by Christmas morning. The aging will help the flavors intensify and heighten for a wonderful cake. Many people enjoy making these cakes and giving them as gifts to friends and family during the holidays. I was not able to obtain either Billi’s or Atti’s recipe, so I have included the recipe for the “Certosino” as deposited in Bologna’s Chamber of Commerce by the Academy of Italian Cuisine, Bologna Delegation on November 21, 2001. It can’t get more official than this! 3. place the flour on a table and form a big volcano. 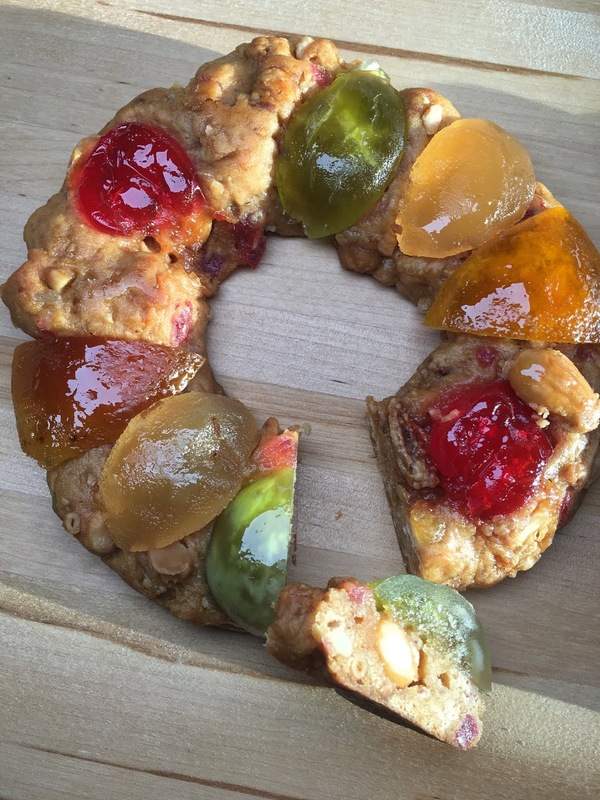 In the center of the flour volcano, add the unpeeled almonds, pine nuts, cocoa, the fruit jam, cinnamon, ammonia carbonate, wine syrup or marsala wine, honey with candied fruit and knead, until you get a thick mixture but not solid. 4. Give the mixture the shape of a large donut, put it into a mold greased with with butter and then let it rest in a warm place for at least 3-4 hours. 5. Before baking in preheated oven at 180 ° for 40-50 minutes, garnish the surface with the remaining candied fruit and peeled almonds. 6. Once cooked and completely cooled, brush the cake with honey, previously liquified over heat. 7. Let the cake mature for at least ten days* wrapped. For optimal conservation wrap in food grade plastic paper, parchment paper or aluminum paper and keep in a cool room. - The cake should be served cold and preferably already cut into thin (2cm/1 inch) slices. - Use a cake mold with a hole in it (or you can just leave a space in the middle), about cm 25 width and 6.5 cm in height. - Ideally you should allow the Certosino to mature for 4-6 weeks. Buone Feste literally means "happy holidays". has nothing to do with being politically correct, Italians are just being practical as there are many holidays in this period: Christmas eve, Christmas day, Santo Stefano (the 26th), San Silvestro (the 31st) and the New Year! As most of you already know, each region has its own typical dishes and traditions. This also applies to the holidays. Many areas of Italy celebrate Christmas Eve with a big seafood meal, for others its an evening just like any other while there are many “in the middle traditions”. I for example, like to host a seafood dinner with friends on the 24th. Each year I have fun changing the menu with the only constant factor being with friends and different from the previous year. This tradition began when my husband’s family who usually hosts Christmas day lunch is always the same. If anyone tries to change it, my father –in-law complains loudly. It just goes to say how traditional things are in this area. If you ask other Bolognese families, they are eating exactly the same thing, every year. This year I am hosting Christmas lunch for the whole family so won’t be able to host Christmas eve dinner with friends. But no, we will not save ourselves any calories, we will make up with our friends on the 27th. The main meal on Christmas day is lunch so on Christmas morning we generally have a very light breakfast, if anything other than our morning coffee. When the family arrives, I will serve various antipasti including smoked salmon on buttered bread, anchovies served on buttered crostini, culatello salami , Parmigiano Reggiano in chunks and honey. As a first course, the meat filled tortellini served in broth are a must followed by the cotechino which is very much like a salami except it hasn’t been cured so needs to be cooked for a long time. My in-laws love it! I prefer something lighter so I’m planning to also serve bollito, a selection of boiled meats with salsa verde (parsley and caper sauce) and Mostarda di Cremona (cooked fruit in syrup and mustard essence). All of this accompanied with mashed potatoes, lentils my Roman grandma’s way and salad. At the end we will have 2 kinds of pan speziel (or certosino), panettone, dried figs, walnuts and panettone. Pan speziel is a typical Bolognese cake served during the holidays. I will post a second article talking about the history and comparing the two famous brands of pan speziel in depth. Photos of my holiday meal will be forthcoming as it all develops. Check Facebook (https://www.facebook.com/TasteItalyBologna/) and my Instagram (@Maribel_Italy_Pasta) accounts to see the photos as soon as they are available. 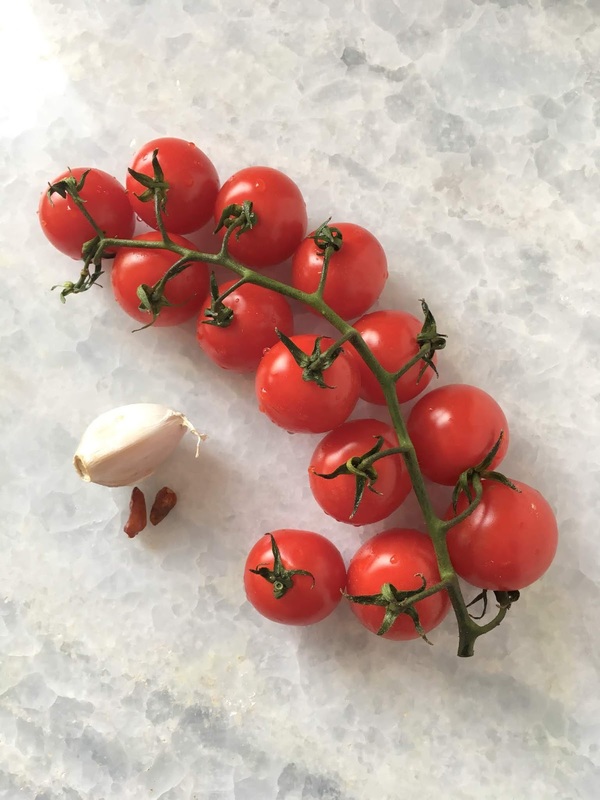 Italian cooking is all about the ingredients. A few, well chosen ingredients is all you need to make an excellent meal. Take for example, Naples' Spaghetti "sciuè sciuè". "Sciuè sciuè" means fast and quick in Neapolitan dialect. It is a pasta dish that does not require any special skills from the cook, just his or her ability to choose the best ingredients for this dish. Herein lies the secret to its success.